I'm working on Smith Mountain Morning. I've wanted to make this design by Bonnie Hunter for quite sometime now. 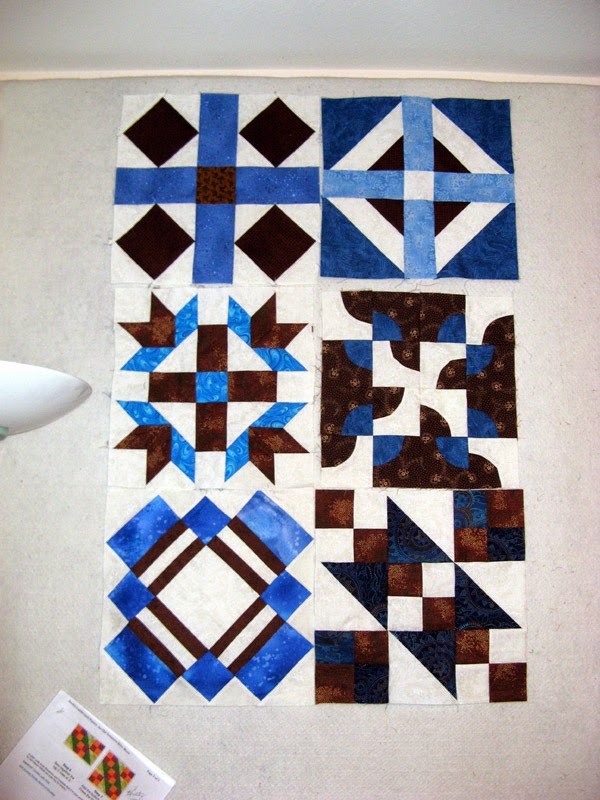 I worked on cutting the pieces and got about half of the log cabin blocks done last weekend at the quilting retreat. This weekend I spent time putting the rest of the log cabin blocks together. 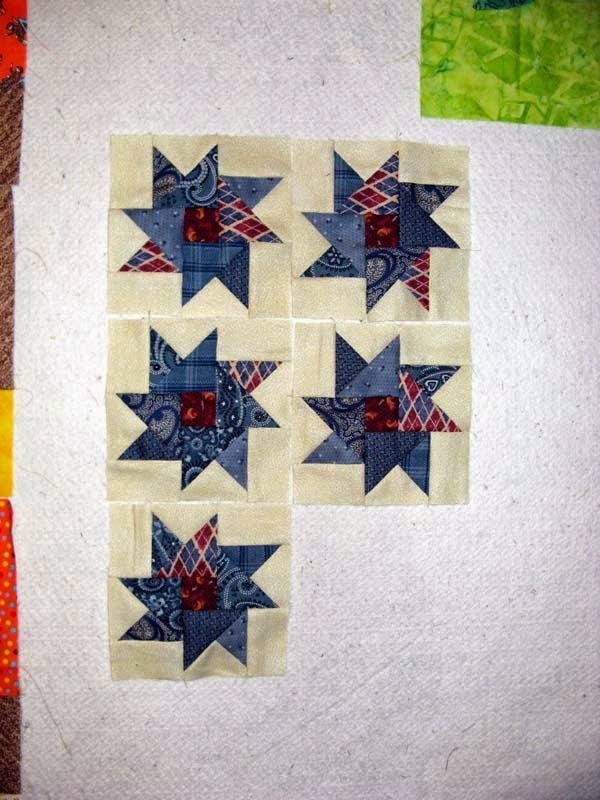 I have just made a dent in the star blocks, but the rest should go together pretty fast. I have all the individual units assembled so now it is just a nine patch to assemble. 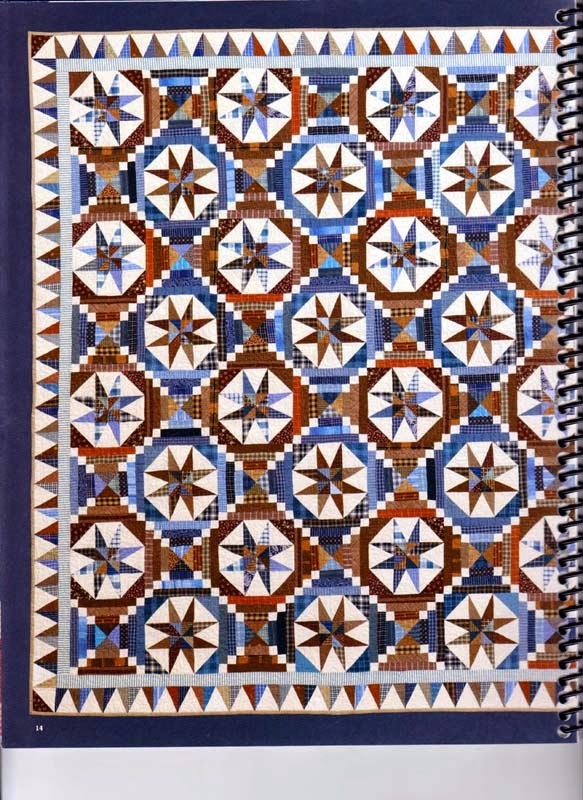 There are some that are with brown star and blue corners and nearly as many with blue star and brown corners. It really is as rich as it looks. I'm starting to figure out now what "K" name to give my project...help always happily received. 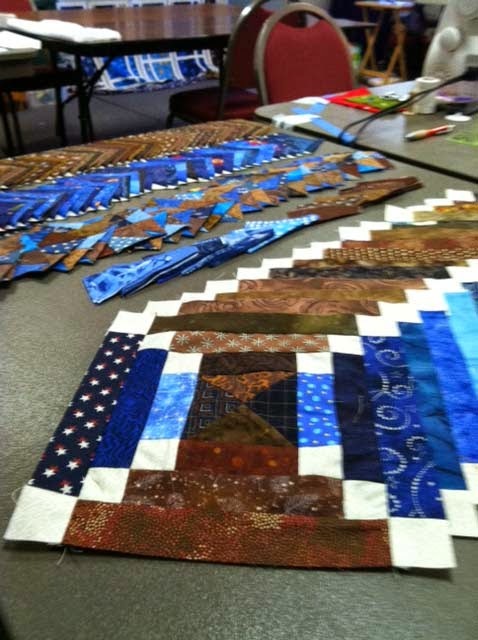 While at the retreat I had a lot of blue and brown fabrics for my Smith Mountain Morning project so our group used them for a Bible block quilt we will gift our retreat location. These are the first six with three more yet to be made by Shelly, Bonnie and me. I'll tell more about this project as it comes together. Enjoy this last day of June! 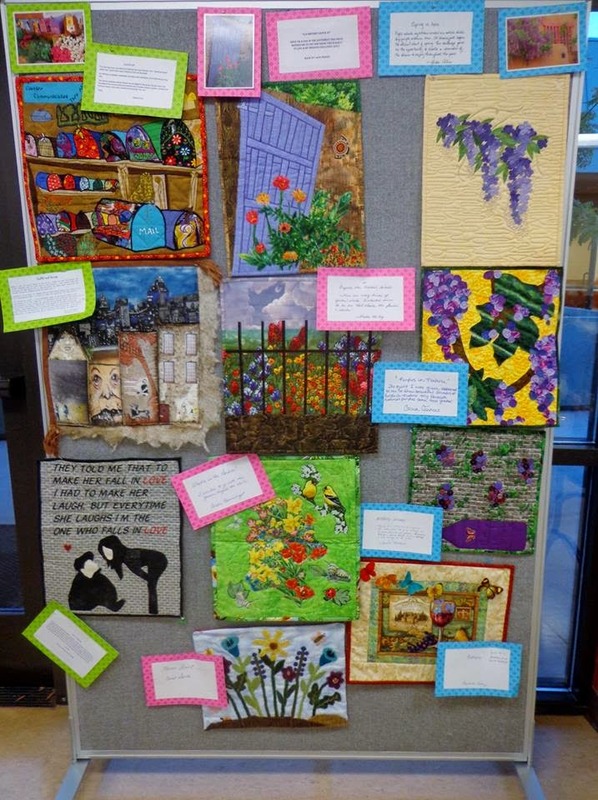 More great projects on the design walls of quilters around the globe through the links today at Patchwork Times. My June UFO Kolumbia is finished! Love that all fabrics came from my stash...even the backing that is pieced from leftovers of the same fabrics used in the front. 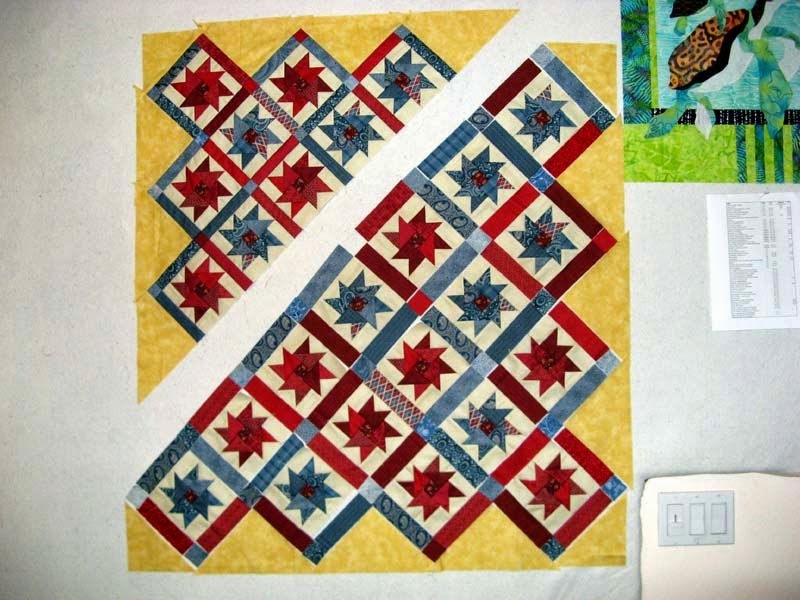 I made a change to the design by adding pieced corner units that compliment the three borders. 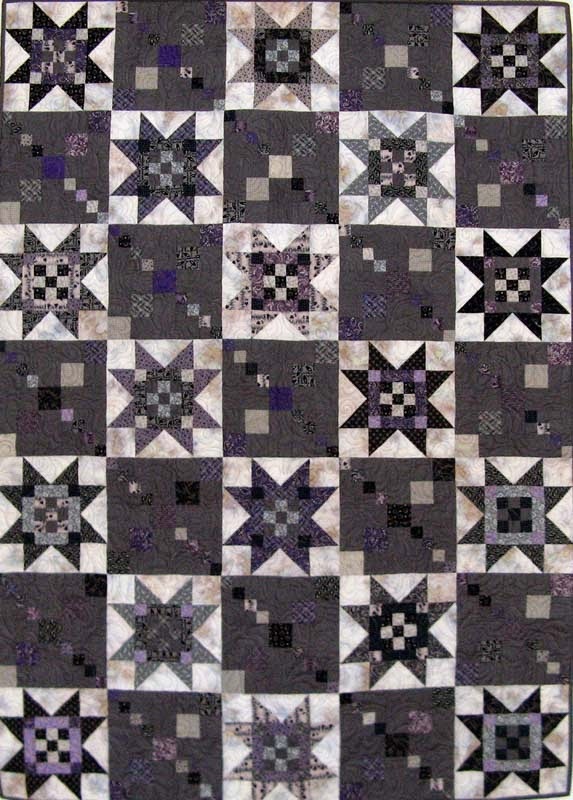 Kolumbia is a design called Scrappy Star by Wendy Gilbert. It was nice sewing something red, white, and blue through Flag Day. I'll probably keep it on my design wall through the 4th of July. I worked to have Smith Morning Mountain finished during the retreat this past weekend. 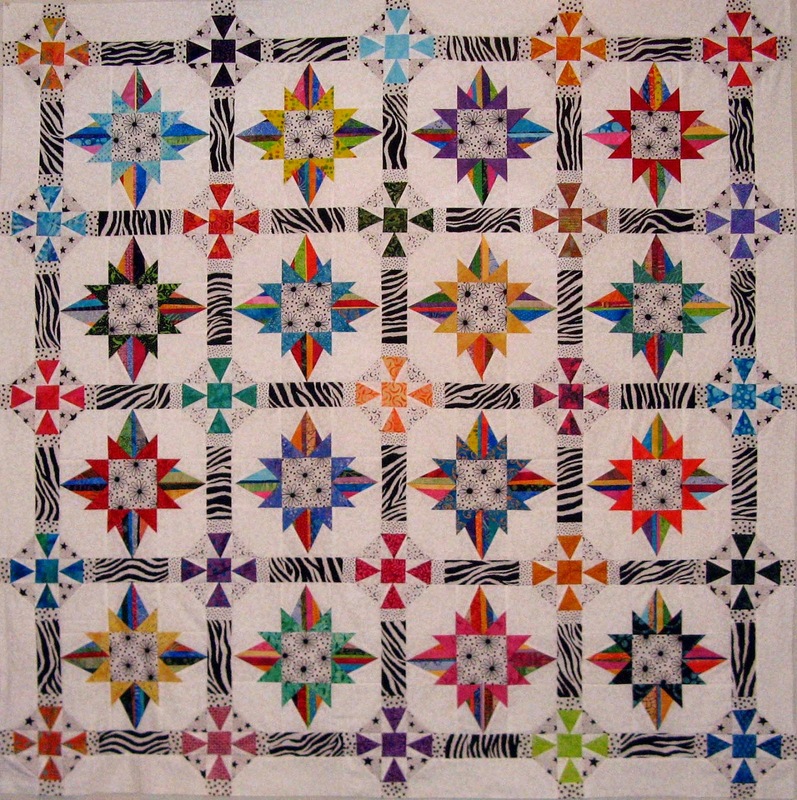 This is a two block pattern designed by Bonnie Hunter that can be found in her Scraps and Shirttails II book. 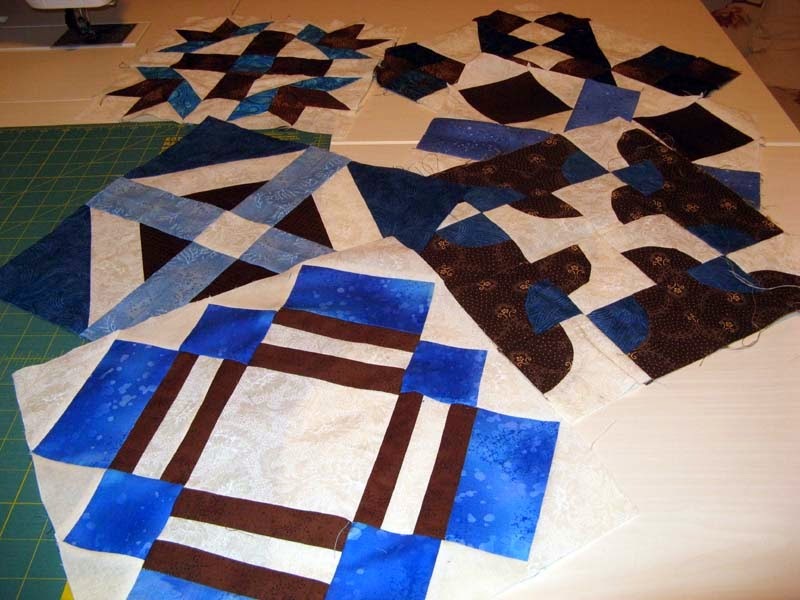 I have another 14 blocks to go of this design; pieces are cut and ready. The other block you can see from the units and pieces in the back of the photo are ready to go, but somehow the Tri Tool ruler/template didn't make the trip to the retreat with me so no blocks could be sewn :(! At the retreat Sue helped me by cutting out #9 UFO. It has yet to be called out by Aunt Marti in this year's UFO Challenge. It sure is nice being ahead of the UFO schedule. 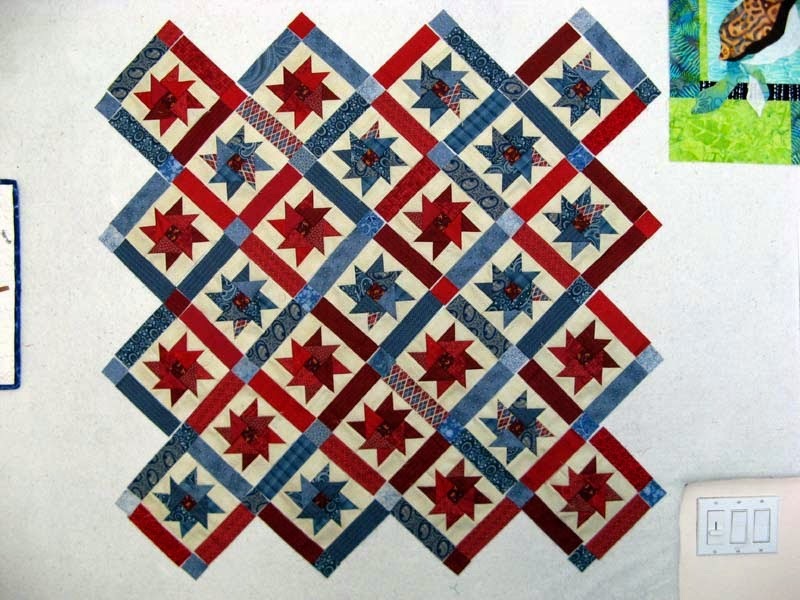 #9 is a Bonnie Hunter design called Fourth of July. I'll be assembling this simple project soon. The quilters who retreated this weekend all have assignments to make a Bible block. Several of them finished during the retreat. Two took them home and I did the same. I have Jacob's Tears to assemble. Once all are finished I'll put them together, Kerry will quilt and our group will gift the retreat location with the project. 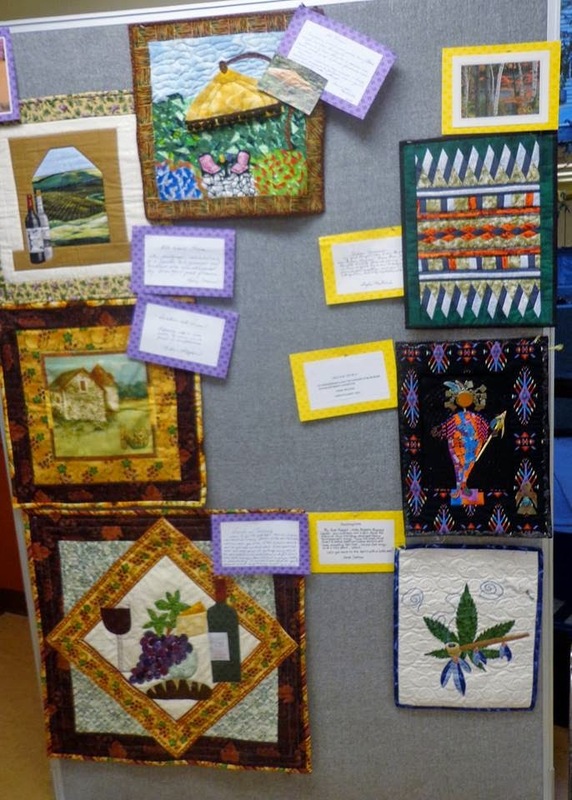 They currently have a quilt on the wall of their dining room that must be replaced! Going to miss my Mom a bunch; she leaves on an early flight back to Maryland tomorrow morning. Two weeks is never enough. Our next visit will be in late August when I fly there to celebrate both Mom and Dad's Birthdays as well as their 61st anniversary. I have nothing more to share than what's been on my design wall for a week. I've been doing all sorts of things with my Mom. 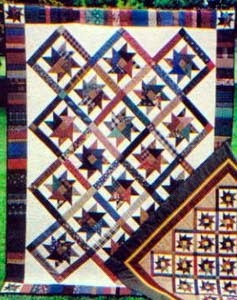 This is Kolumbia a design called Scrappy Star by Wendy Gilbert. My June UFO project. I'll be back to sewing this all too soon. :(! Mom leaves on Tuesday bright and early. Didn't get much further on Kolumbia yesterday. I did add the setting triangles and corners to the design wall. I should be putting this together the first few days of this week. 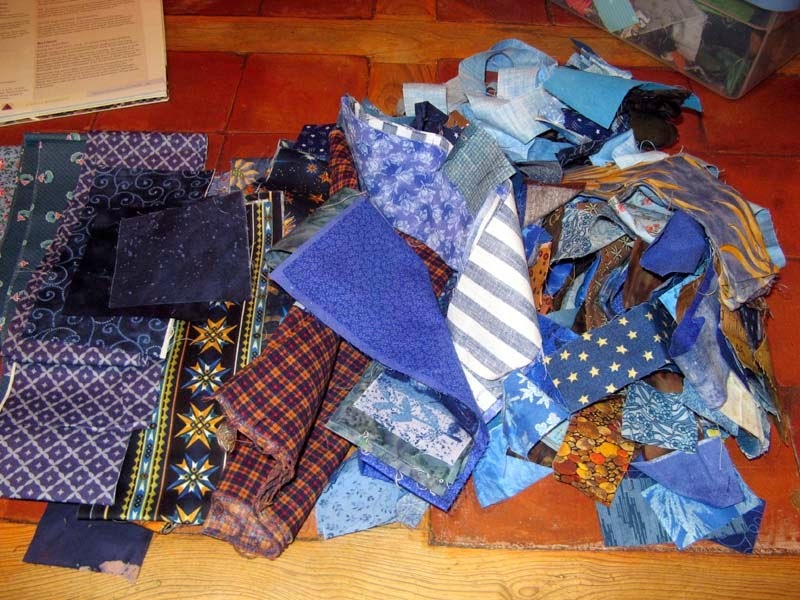 These scraps are blue, brown, and neutral that I plan to use for Smith Morning Mountain. I will need to do a second sort to match up the right shades of all the colors...but this is a start. Finally I get to show Kontimplate. This is the project that I created for the Whisper Challenge. If you follow the yellow cards below you'll see where my group started. Boy was I way off! The purple cards follow a photograph that didn't make it into the picture :(. Then there is the green, pink, and blue groups. Everyone enjoyed the experience even if they didn't end up coming anywhere close to the beginning. There is a retreat in my week's itinerary. More on that the next time. 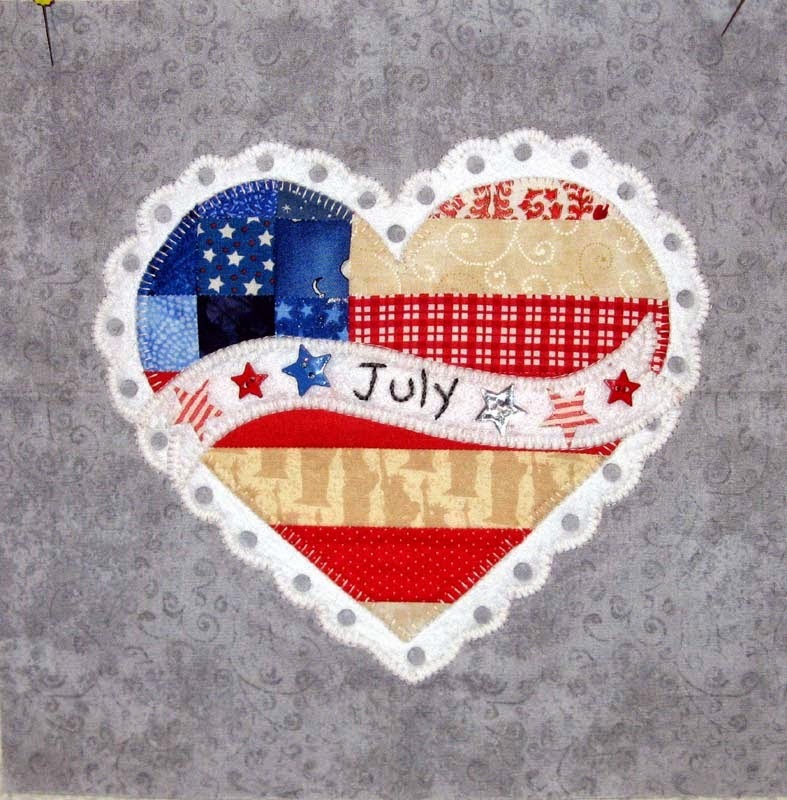 Enjoy your week and see what everyone else is sewing at Patchwork Times. 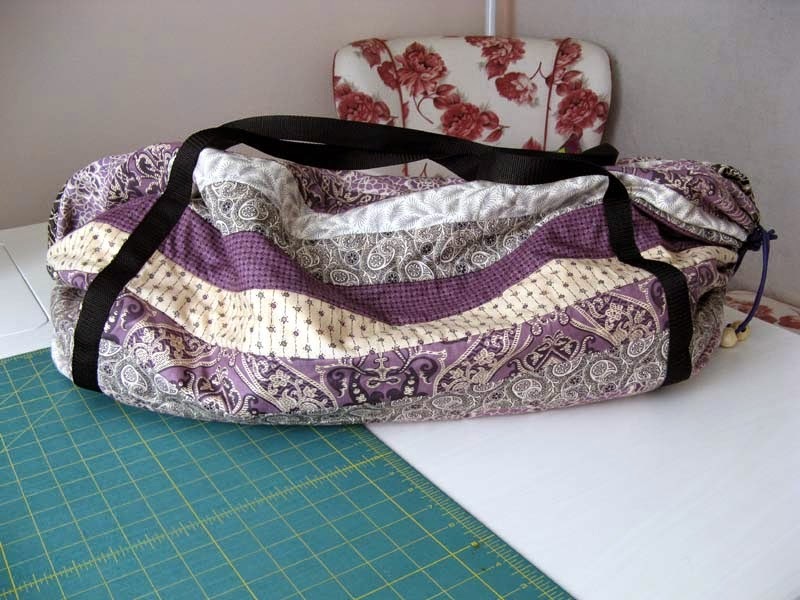 Isn't this a great quilt carry bag? Mom made it from 2 1/2" strips. It has Velcro closure and draw string sides with web strapping. It folds out flat, pull in the sides to fit the contents and close the bag with the Velcro. It's a great bag that will see lots of use from me. Thanks Mom! 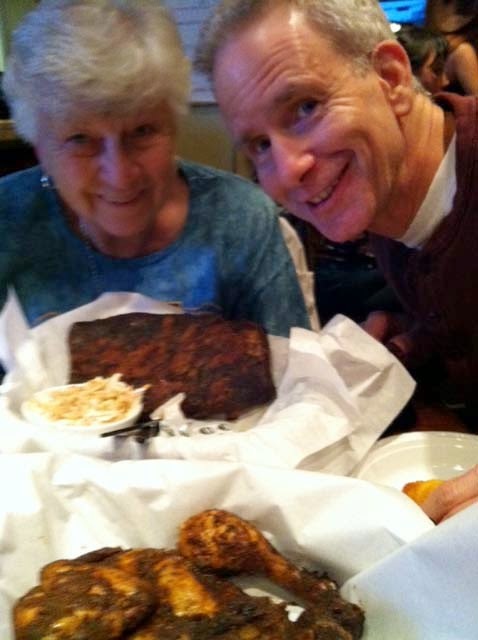 Here is Mom and DH over our Friday night meal. 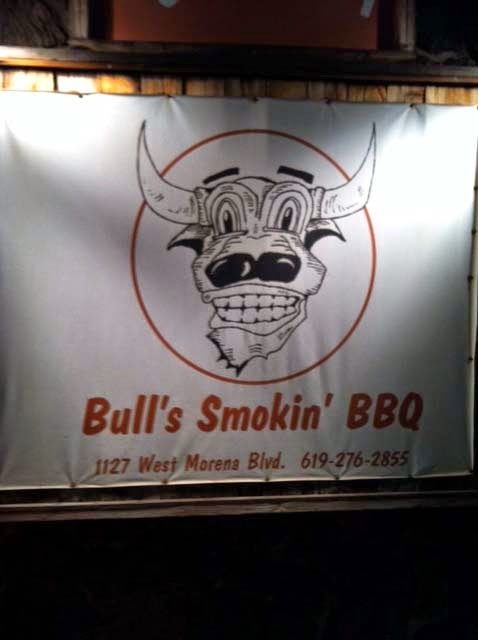 At Bulls' Smokin BBQ you don't leave hungry! Kolumbia is my June UFO. I cut the setting triangles and corners out of a gold fabric. All these fabrics are pulled from my stash. Can't count anything as used yet, but next Sunday will see a change =^.^=! This is the project I'll be working on at the retreat next weekend. I have been wanting to make this project for the longest time. Smith Mountain Morning by Bonnie Hunter. I will be sorting through my scraps during the next few days for all the blues, browns and neutrals for this one. For this week no change in the stash. 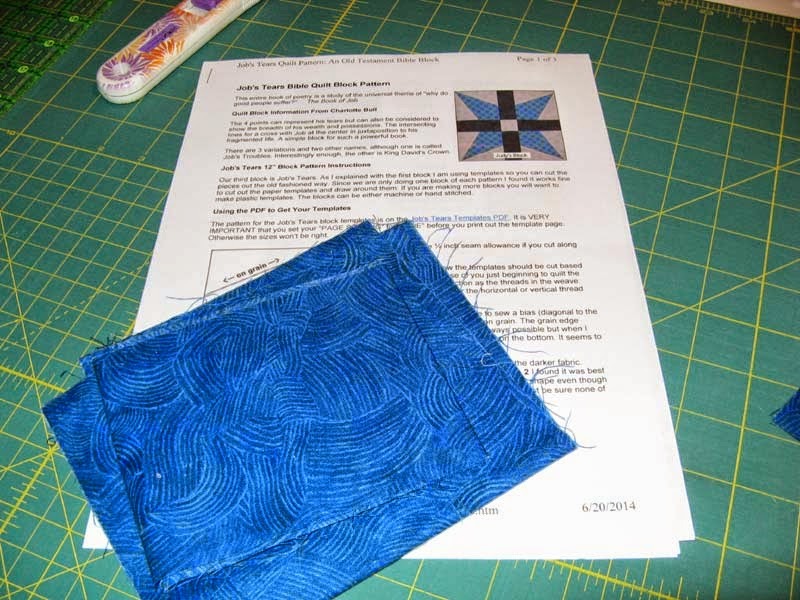 Enjoy other projects and how everyone is using their stash at Patchwork Times. I have a busy sewing room... I have been working on my June UFO. 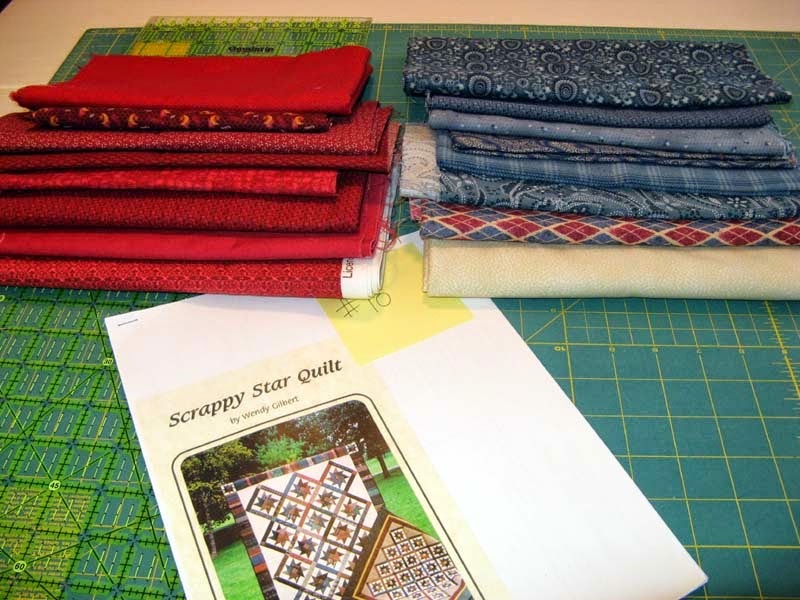 The design is Scrappy Star Quilt by Wendy Gilbert. 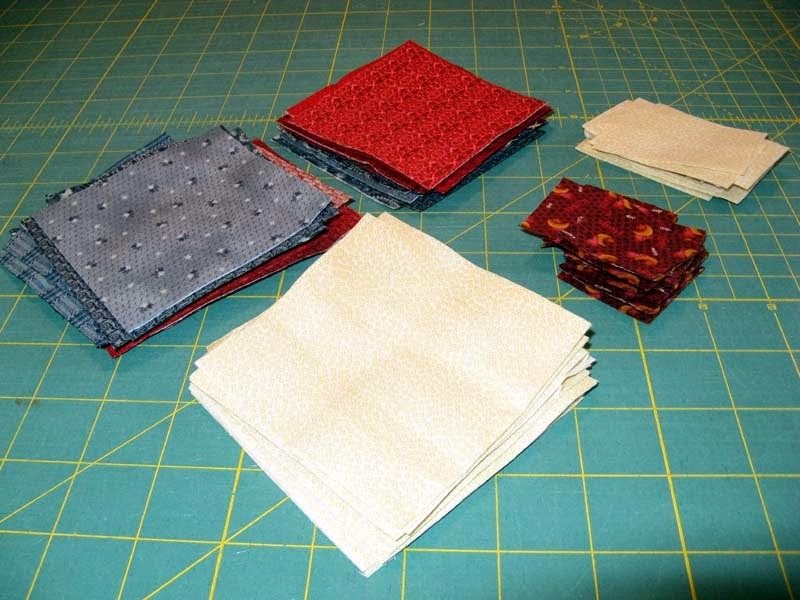 These are the fabrics I plan to use along with a gold for the setting triangles that I have yet to discover in my stash. The first cuts were made on Saturday night. The small red square will be consistent through each of the stars. These are the reds just getting started. The first five blocks of 25 are complete. There are lots just stitches away from becoming stars. Sashing will be after that. You can see Mom and I are quite busy. 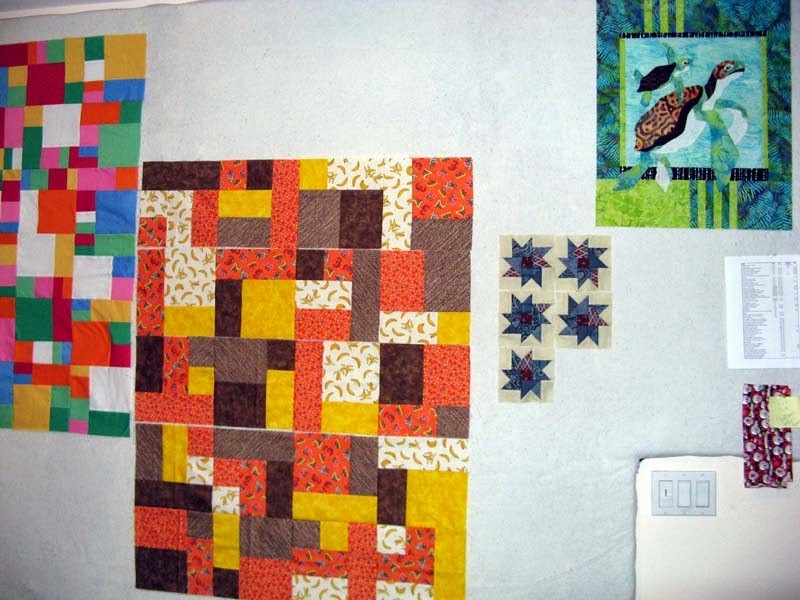 The project on the far left is a design called Crazy Eights. Yellow Brick Road is in the center. Both of these Mom is putting together. We have a fun day planned for today. A Buggy Barn house will be attempted! Hope you are having a wonderful day. 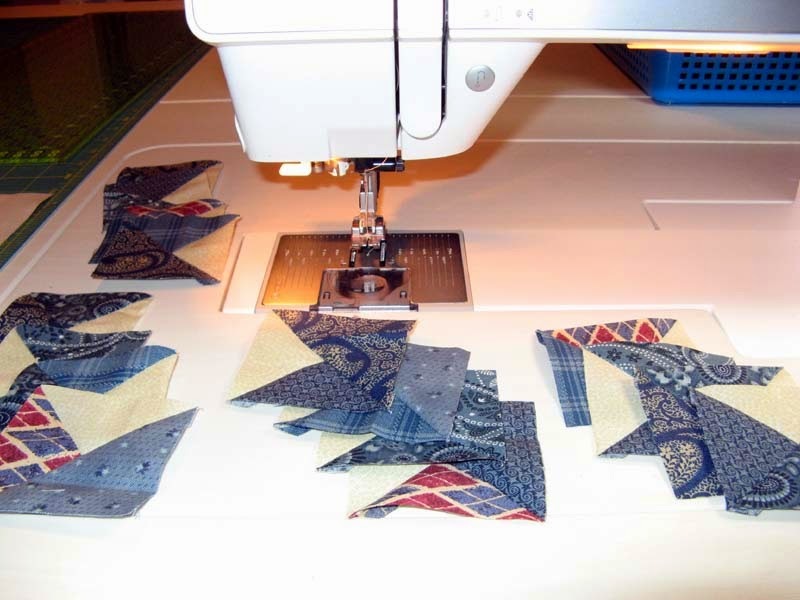 Find time to check out other projects through the links at Patchwork Times. I just couldn't resist this for the back of Krackerjack. There are so many dots in the fabrics that I used in the top of the quilt...it seemed the perfect match. I found it at Paradise Sewing in Poway on Friday. 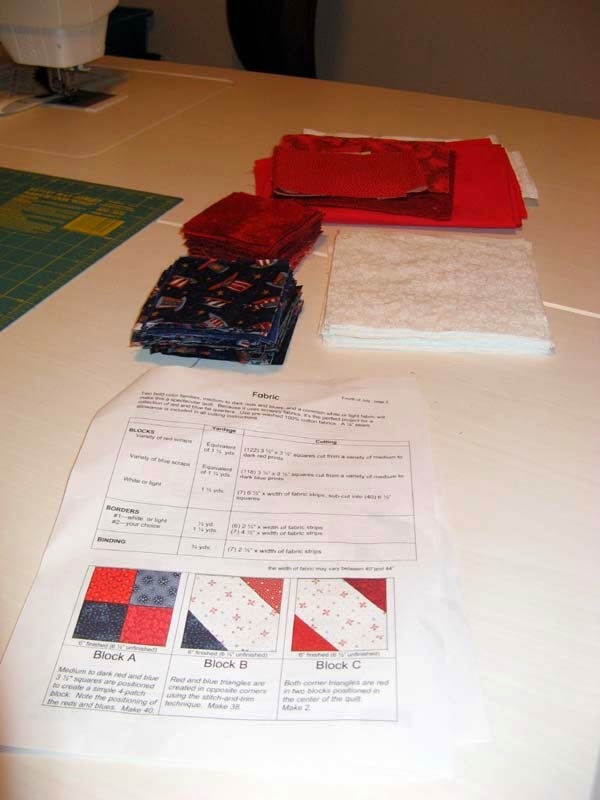 I've got a busy week coming with Sunshine Quilt Guild monthly on Tuesday. It is the annual challenge reveal, a block of the month, yearly opportunity winner announced, potluck and auction. Tomorrow I'm taking the day off to do something fun with Mom. Hope your week is filled with all kinds of fun things. 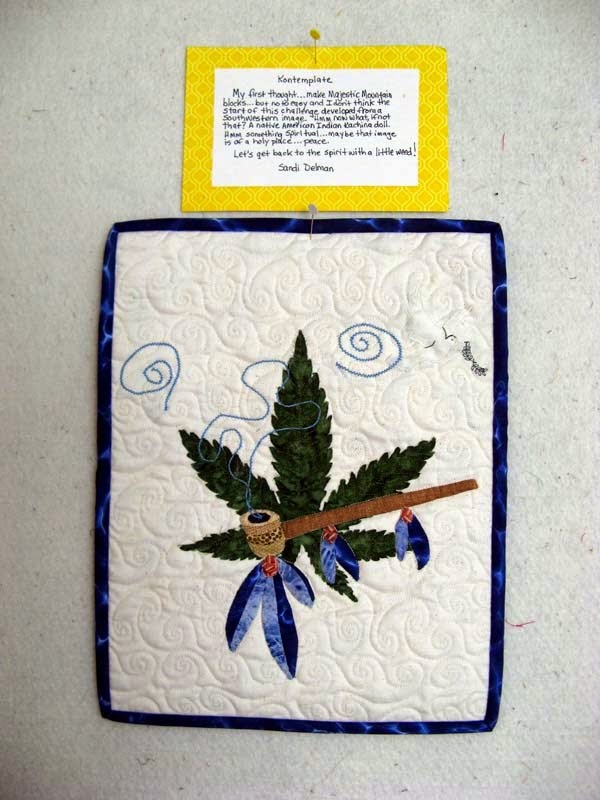 Take some time to see how everyone else is using up their stash at Patchwork Times. I'm anxiously awaiting Southwest touchdown of flight 2167 tomorrow at 9:50 pm!!! Sunday brought the finish of Krackerjack. This design by BlocLoc.com and Janna Thomas was so fun to put together. 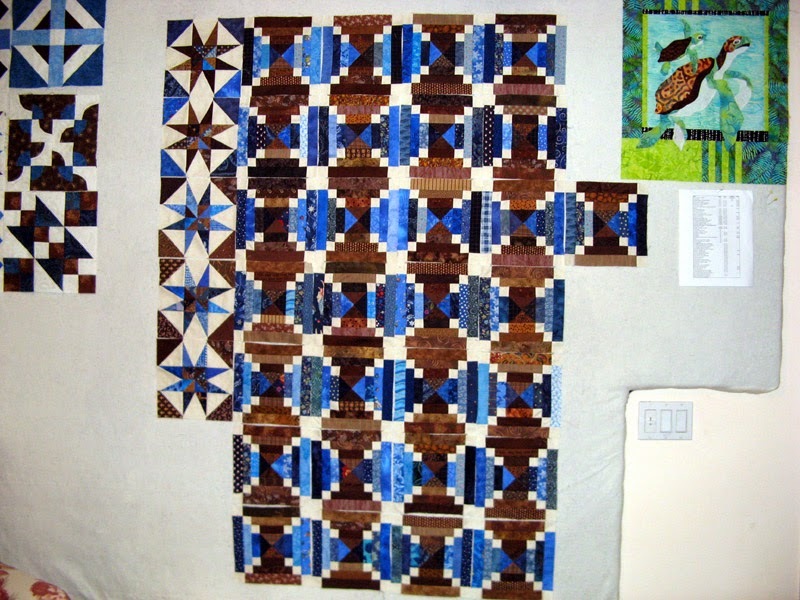 I started the project in January at Road to California Quilt Show. I wanted to use the suggested fabrics from Kaffe Fasset and Brandon Mably through gloriouscolor.com, BUT the fabrics didn't arrive on time for me to use them. DH suggested using black and whites...I went for it! I'm excited how Krackerjack turned out! I made the project with 16 blocks mainly because I got a little carried away making the strings. This turned into not having enough of the star and moon black/white fabric...stash to the rescue! I found a good star and larger random dot in the black/white stash to make things work. The zebra print is planned for the binding. I'll admit that a mistake was made when putting this project together; you'd never know unless I brought it to your attention... The corners of the blocks should have been 3 1/2" cut. I somehow picked up 2 1/2" cut. I don't think it makes any big design changes so I left it. Frankly my stash couldn't have recovered from this and stash was pretty much all that Krackerjack was about! I'm so excited, counting down the days now until my Mom comes to visit for a couple weeks. Flight arrives on Thursday! We will be having fun at the annual BAE Systems Quilters Plus Sewing Retreat the end of the month in Lakeside for one thing. Who knows what else we will be doing... Just spending time together will be wonderful. I'm ready for what's next in the sewing queue...Check out other awesome projects through the links at PatchworkTimes.com. I am still busy working on Krackerjack. It is Star Fusion by BlocLoc.com. It seems to be a little difficult to find, but it is available online and maybe your local quilt shop if they are selling the fabulous rulers they manufacture. I've started sewing each row together...notice how much the seams draw the project together? That top row looks like something is drastically wrong! I did run out of two fabrics while putting this project together. 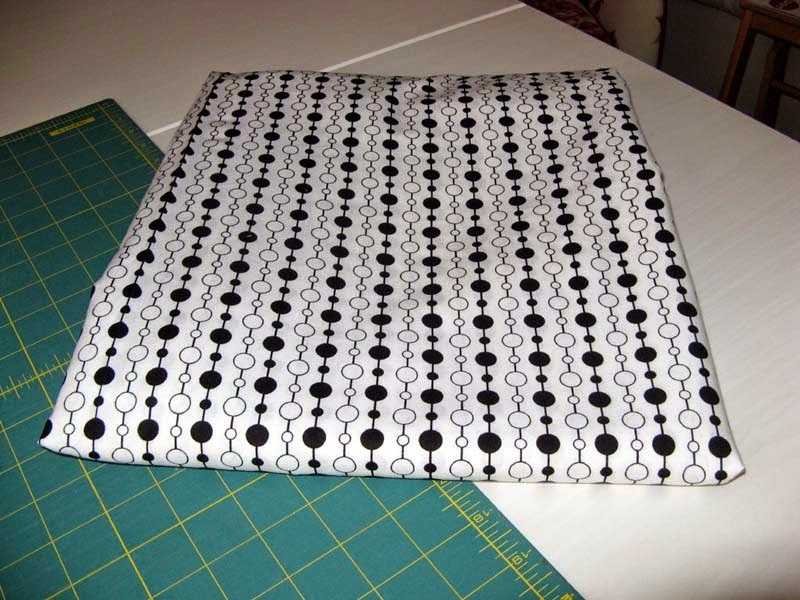 I've been able to bounce back with my stash and the ability to do it is made easier since the fabrics were both black and white designs. Besides the background that I purchased in January all of this is from my stash. There is one more border that is predominately white that may or may not be added...we'll see. Oh in case you are wondering that's Kooter Klan on the top right waiting for applique time. 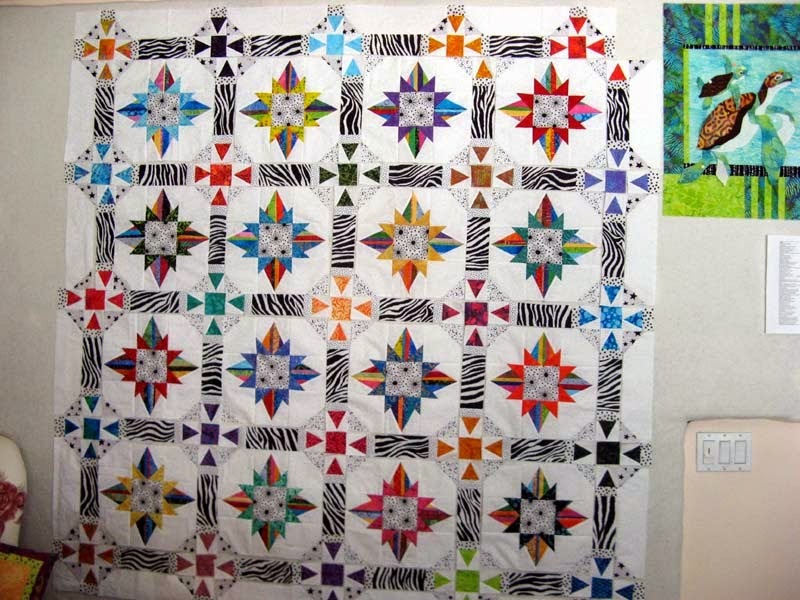 It is a design by Karen Brow of javahousequilts.com called Newly Hatched. 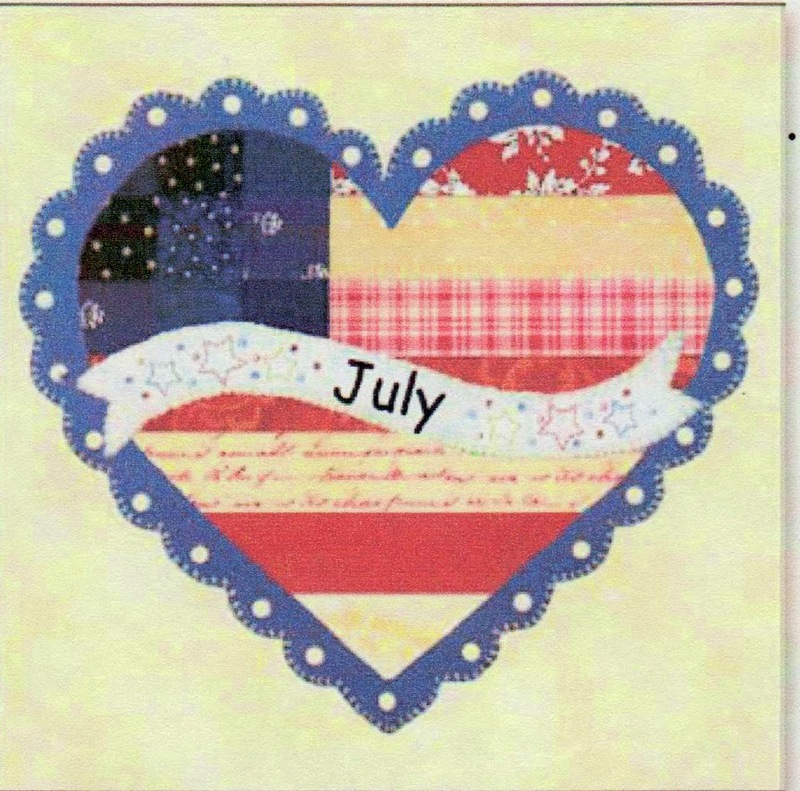 For June Sunshine Quilters BOM Sherri has coordinated a calendar quilt project. It is designed by Jennifer Bosworth of ShabbyFabrics.com. You can see I have July to sew up. The doily (outside border) is accomplished with a single hole puncher. Do you have one of these? DeLinda says she has one that I can borrow. I hope she remembers to bring it with her tomorrow. Sunshine meets in just over a week and I haven't even started. Oh, Bonnie Sue...I'm finished with my Whisper Challenge...ready for the big reveal! Today is the 52Quilts.com UFO Parade. I have Koliding Krosses as my May finish. If you have time, check out the parade Aunt Marti puts together on the first day of the month. 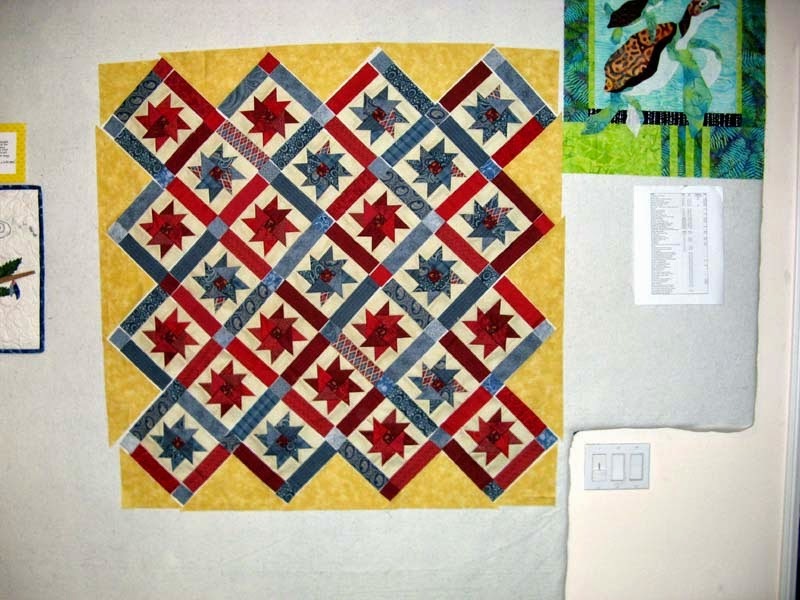 Aunt Marti also pulls the next month's project to work on (#10) and mine is the miniature Scrappy Star Quilt shown on the bottom right. I have already figured out it's name! How about Kolumbia? 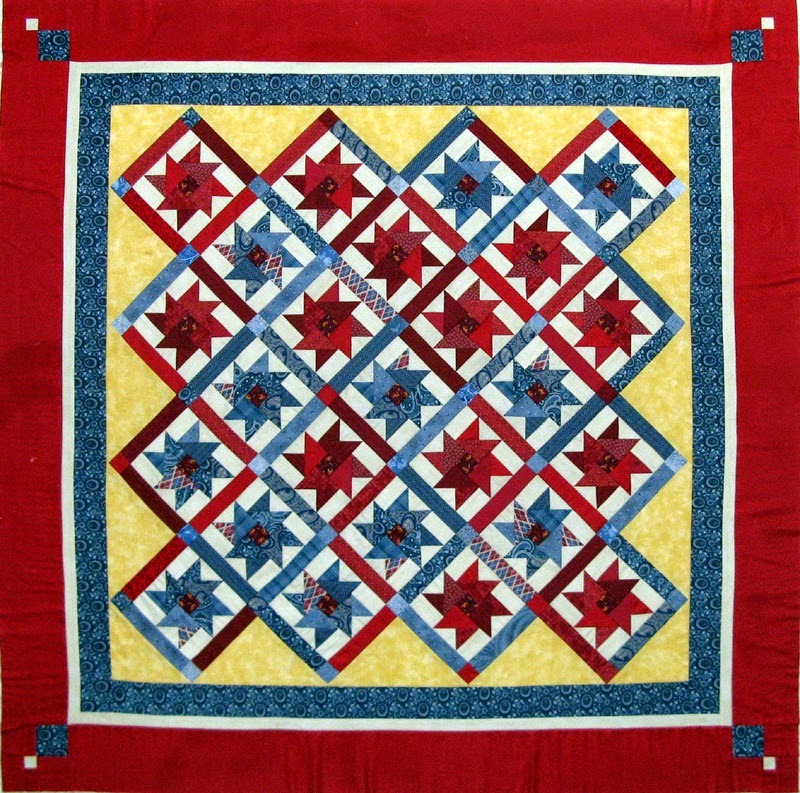 It finishes at 48" square and was designed by Wendy Gilbert of Morning Star Designs. Fabrics haven't been chosen yet, so who knows what will come out of my stash! Last to share is Konqueror complete. This project came from a workshop I took in September of last year from Joyce Weeks of geoffsmompatterns.com. Joyce calls her design Survivors. It seems I don't usually select feathers as a quilting design, but this time I did. The photograph doesn't do this quilt justice. It is in grays, blacks, purples, and a grayish neutral. The quilting thread is purple. You'd see it very differently if you had it in your hands. 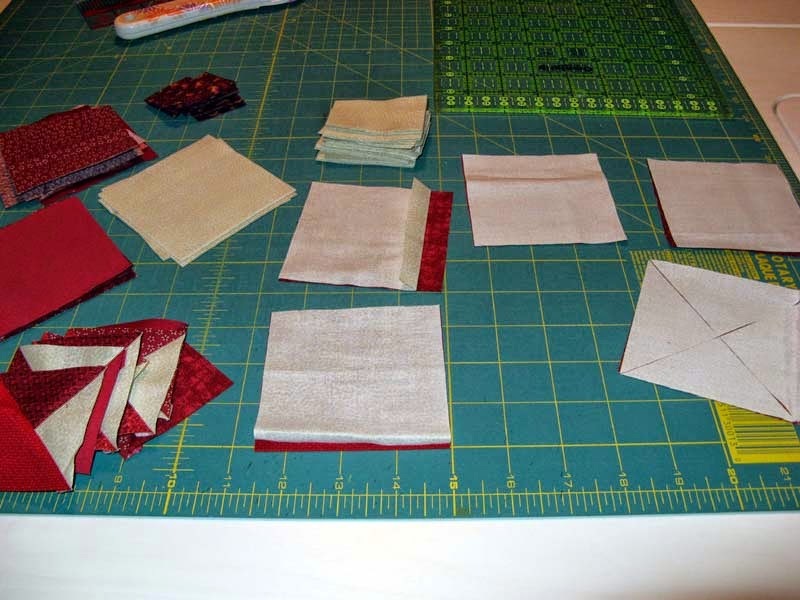 Lot's of projects going on, but no yardage came in or left my sewing room. Maybe next week Krackerjack will be a finish...certainly the BOM and the Whisper Challenge fabrics will take something off. Enjoy the month of June!